3/26/2012Share this story on Facebook! Studying Art History At Home? The Department of Art History at Ithaca College is committed to exploring other cultures. Students don't need to travel to Paris for an interactive learning experience. Every art history major and minor is required to attend three cultural events each semester. The surrounding area provides plenty of art, including Cornell University's Johnson Museum of Art, multiple theater companies, and IC's own Handwerker Gallery. The Fred L. Emerson Humanities Collaboration Award, which helped fund the iPods in Paris project, is granted to H&S students who demonstrate financial need and who are working directly with a Humanities faculty member on a collaborative scholarly project. 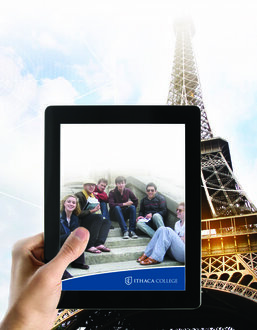 This summer, 10 Ithaca College students will stroll down the Champs-Elysées in Paris with iPads in hand. The City of Light will serve as their classroom and the high-tech tablets their textbooks. The art history and computer science departments at the College collaborated to create an interactive curriculum for the summer course titled Art and Politics in Paris: Reading Power in Space and Image. Each student will have an iPad as a resource for notes, pictures, online quizzes, and interactive games related to the course. 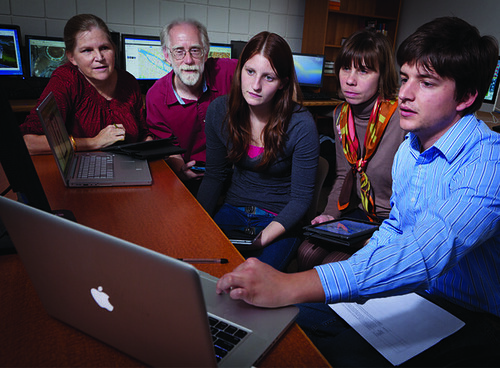 John Barr, chair of the computer science department, worked closely with art history professors Lauren O'Connell and Jennifer Germann to add technology to the course. Barr also enlisted Colleen Muldowney '12 and David Banker '13 to help him create the framework for the iPad application used in the course. Barr has worked with students on other iPad applications before and says the project has been a learning experience for everyone involved. "This project is interesting because it mimics what goes on in real life," Barr says. "Most of the time there's a technologist who knows the technology but doesn't really do the content." The application will help students learn about the art and architecture of paris and what those things mean in relation to the social and political landscape of French history. For example, "When we get to the Palace of Versailles, what do we want them to learn there, and how can the iPad platform enhance their learning?" O'Connell queries. Colleen Muldowney '12, Professor Lauren O'Connell, and David Banker '13 on an iPad application. Using an iPad is an unconventional way to teach a course, but Barr says it's the best way to communicate a course of this nature. "Mobile is the future. This is a better way to interact with information, and we're going to be there." O'Connell adds, "I think it makes the whole experience more interactive and engaging. We get away from the idea that the teacher is just standing there in front of the building talking." Muldowney, who has a minor in art history, worked to ensure the course is the interactive experience the professors want and the students need. She helped O'Connell prepare the art history lessons and helped Barr translate those lessons to the iPad. "Over the summer, I did the content, and I helped Lauren and Jennifer with the research they're doing for the class," she says. "Then, I helped them restructure the class to be more interactive, instead of just spending two weeks in Paris and reading from a book." This research project has proven successful for all parties involved. Muldowney says she loved working closely with faculty to develop the application. "I like working with other students, but working with faculty is such a good experience because I feel that when I talk with them, I'm not only learning new things but also learning how they think." While she's not sure where she will be following graduation in May, Muldowney is excited to make use of what she's learned at Ithaca College. "My education here has made me realize a lot of things about our world. I've really learned a lot here."